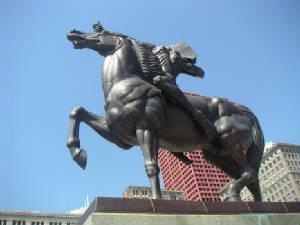 Statue of a Native American. Fine Arts Bldg in background. 410 S. Michigan. GTJ photo. A final reflection on Chicago and its history, including the histories that have not been written. Native Americans. Taking the long view, la longue durée, as the French historians would say, most of Chicago's history is barely recoverable, because it concerns the native Americans who first lived here. Some of their words endure, including "Chicago" itself. When I grew up in Park Ridge, Robinson Woods was nearby, and there were still memories of the last member of the native American family that lived there. My grandmother, who was born in 1895, told me that when she was a child living in the Bowmanville area of Lincoln Square, there were native Americans who lived north of Foster Avenue in what was then Budlong Woods. I was delighted by a recent exhibition at the Art Institute of Chicago that gathered and displayed objects from the material culture of native Americans from our area. We all have an obligation to recover what we can of the history of these first "Chicagoans." Mayor Richard J. Daley. Lytton Strachey, the British historian, wrote in his 1918 book, Eminent Victorians, that it was time to look the Victorians in the eye. He offered frank assessments of the accomplishments and of the failings of important figures, at a time when the disruptions of World War I were putting an end to the Victorian era. I often feel the same way when I reflect on the Chicago histories that have not been written. Are we ready to consider the era of the late Mayor Richard J. Daley? He first became mayor in 1955. Now it is time for the professional historians to take a more comprehensive approach. The Chicago History Museum's on-going oral history project focussed on Mayor Richard J. Daley will play an important part. Mayor Harold Washington. Another regret is that there is no definitive biography of the late Mayor Harold Washington, now that time has passed. He became Mayor in 1983 and died in 1987. He was the city's first African-American mayor, and played a role on the national stage. The authorized biography, Harold, the People's Mayor, by Dempsey J. Travis, first appeared in 1988. I treasure my own personal memories of meeting with Mayor Washington on various issues, and I know some of his former cabinet members. Everyone remembers his warmth and his humor and his love for the City of Chicago. There are some excellent published recollections of the Mayor, but no definitive survey of his life and times. This is a remarkable story, one that needs to be revisited. A Religious History of Chicago. Another book that is waiting to be written is that of the religious history of Chicago. There is a richness and a diversity there that never has been documented as a whole; the religious stories are generally told as individual strands. Nevertheless, there are some common elements. How does religious life change when immigrants arrive? As time goes on, does the church reach out beyond its original ethnic or racial base? When does it begin to use English as the primary language in religious services? How does the nature and importance of religious life change as immigrant families become assimilated to the wider culture or encounter barriers to assimilation? What happens when the original parishioners move out of the neighborhood? The on-going exhibition series at the Chicago History Museum that began with Catholic Chicago and moves on in 2012 to Jewish Chicago should play a part in filling this gap in telling Chicago's story. I can think of examples from my own life. There is one church in Logan Square where they still use Norwegian. My family lived there over 100 years ago, and now it is largely Hispanic, yet the church remains and the language remains. I think of the time that we accompanied two Jewish friends to visit their old neighborhood on the far South Side. We found the synagogue they had attended as children, and it is now used as a church by a congregation of African-Americans. When we stopped to look, two of the members graciously invited us in. My wife and I witnessed a fascinating exchange of stories, as our Jewish friends explained the early history of the building and the African-Americans described what had happened since that time. There are many other religious trends associated with Chicago. Chicago was the home of Thomas Dorsey and of gospel music. Chicago was the home base of Dwight Moody, and the Moody Bible Institute remains one of the most powerful evangelical forces in the world. Chicago was the scene of the first meeting of the Parliament of the World's Religions, which was first held in 1893 in conjunction with Chicago's Columbian Exposition. Chicago has been a center for the African-American Muslim communities. It sometimes is said that Chicago has more seminaries than any city outside of Rome. Why are there so many? At some future date, the Chicago History Museum's proposed exhibition, Muslim Chicago, will tell that story, and many others. On the day of the funeral of Pope John Paul II, there was a procession up Milwaukee Avenue past a series of Catholic churches built for the Polish community. As they marched from one great building to another, they passed shops with signs in Spanish, shops with signs in Polish, and shops with signs in both languages. The story of religion in Chicago, which is so intertwined with the story of neighborhoods and migration, all the way from the Mississippi Delta to Poland, never has been given the treatment it deserves. I offer one link to a website that advertises one of my favorite Chicago books, Ecclesia: Greek Orthodox Churches of Metropolitan Chicago, by Panos Fiorentinos. This is a photographic journey through the 59 churches of the Greek Orthodox Metropolis of Chicago, including more than 400 richly-colored photographs. The book also included material gathered from interviews with priests and parishioners that offer insights into some of the questions I have raised above from the perspective of one religious community. Finally, I wonder whether we are doing enough to preserve the history that is being made today. My first direct ancestor who came to Chicago was Svale Staaleson, who came here from Norway in 1853. (See his description of life in Chicago in 1859.) The story of the Norwegian community has been richly document by the historian Odd S. Lovoll in A Century of Urgan Life: The Norwegians in Chicago before 1930. (Distributed by the University of Illinois Press for the Norwegian-American Historical Association. Urbana, Illinois; 1988). 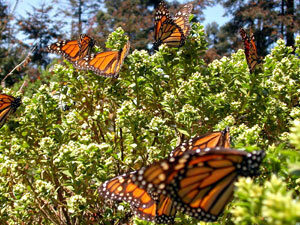 I return to the image of the monarch butterfly and thoughts about the history that is being made today. Are we doing enough to preserve the stories of today's families in Chicago, including the immigrants who do not have English as their first language? When the time comes to examine their lives and times, will the right resources be available so that their stories can be told? Monarch butterfly - a symbol of the Mexican community in Chicago.